The Sofa Collection Vintage Leather Sofas by Forest Sofa are available at Harvest Moon, your Forest stockist. 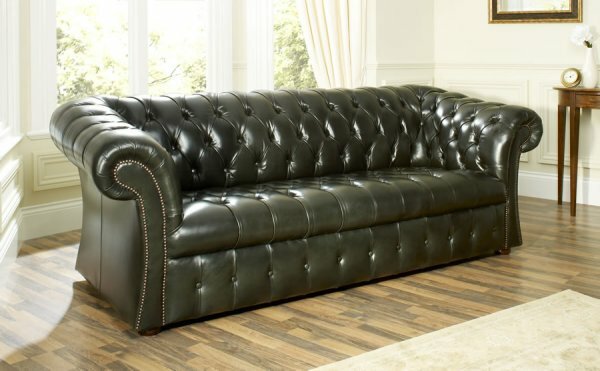 A unique collection of vintage leather sofas, vintage leather sofa beds and vintage leather chairs all handcrafted here in the UK from premium European leathers with a 4-8 week lead time. The 5 sofa models in the Vintage Leather Sofa Collection by Forest Sofa are as follows: The Balmoral Chesterfield, Baron Chesterfield, Gladstone Chesterfield, Hampton Chesterfield and Royal sofa. 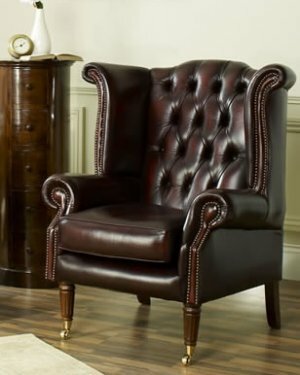 The Vintage Leather Collection also includes the following chairs: The Douglas, Regency, Scroll Wing Chair, Viscount chair, Directors Swivel chair and Executive Swivel chair. All pieces can be found below. The Vintage Leather Collection has timelessly crafted leather pieces meticulously handmade in a lengthy process involving weeks of individual care and attention. The image above shows the Forest Vintage Leather Royal 2 and a half seater sofa in Pure Aniline Medium Brown with studded facings. 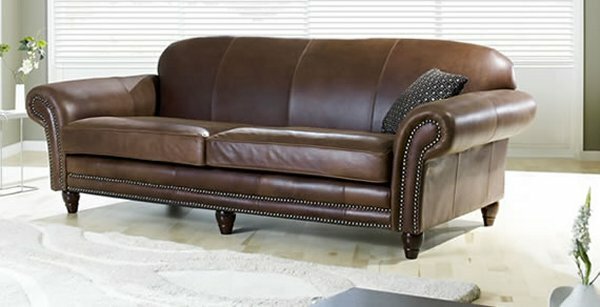 The Vintage Leather sofa designs include the Chesterfield sofas, probably the most famous of all English sofa designs. The Vintage Leather Chesterfield sofas are available as a 2, 3 or 4 seater sofa whilst the Royal sofa is also available in half sizes from 1 and a 1/2 love seat sofas right through to large 4 seater sofas so there is something to fit in all room sizes. Best of all 2 of the Vintage Leather sofas are also available as large leather sofabeds. The leather sofa beds are manufactured with a solid metal two fold frame and a combination of wooden slats and webbings, making the sofa bed suitable for everyday use. A 12cm sprung mattress comes as standard, but air or memory foam mattresses are optionally available. Should you wish to visit us in person in sunny Southport we have some pieces of Forest Sofa furniture on display. Directions and map. We can also arrange an appointment for you to visit the Forest Sofa showrooms in Manchester to view the whole range if you wish. FREE delivery on all FOREST SOFA orders to UK mainland addresses at Harvest Moon! 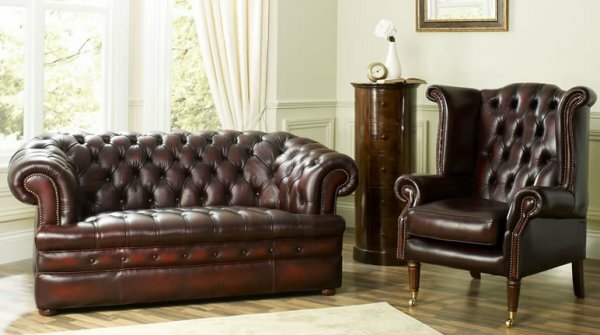 Regarded by many as the perfect Chesterfield sofa, with hand buttoned seat, renaissance hand studding and raised mahogany feet on polished brass castors the Balmoral Vintage Leather Leather Chesterfield Sofa is a stunning design, evolved from the original 1800's Chesterfield design. The image above shows the Balmoral sofa in Pure Aniline Tan so you can see the side of the sofa as well as the front and the one below shows it from a more front on view.. The Baron Vintage Leather Leather Chesterfield Sofa is upholstered and hand finished in oxblood red leather, enhanced by the application of a surface dye to provide the antique effect that strengthens the vibrancy of the colour. The Forest Baron 3 seater sofa and Scroll Wing Chair in Oxblood Red can be seen in the image below. 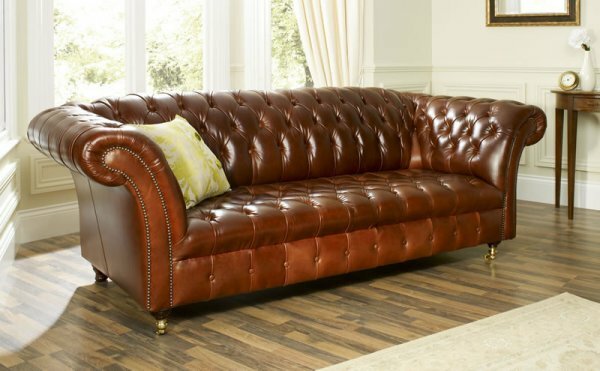 The Gladstone Vintage Leather Leather Chesterfield Sofa by Forest Sofa with plump yet tightly upholstered curvaceous arms is a picture perfect British classic Chesterfield sofa with traditional craftmanship - choose as a true centrepiece for your sitting room and you won't be disappointed. The 3 seater Gladstone sofa can be seen in the image below in Pure Aniline Green with a hand buttoned seat platform. The Hampton Vintage Leather Leather Chesterfield Sofa is Forest Sofa's original Chesterfield with straight scrolled arms and a signature low back. It is shown below in Pure Aniline Spice with a modern single cushioned seat and is also available to order with 2 or 3 individual cushions. There is also a choice of cushion fillings to suit your personal preferences. A hand buttoned seat platform similar to that shown on the Baron sofa (no cushions) is also available. 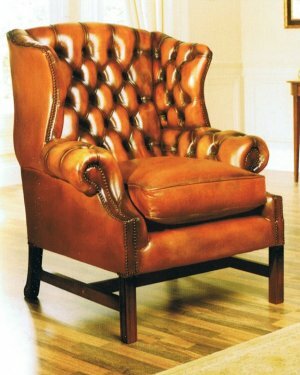 The image also shows the Hampton Club leather chair. The image below shows the luxury designer 2.5 seater Sofa Collection Royal Vintage Sofa in a gorgeous Pure Aniline Medium Brown leather. 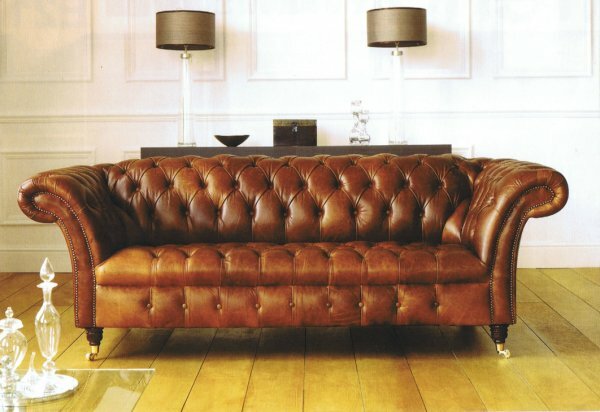 The Royal sofa is set on cabriole mahogany legs and studded facings exudes style, comfort and grace. Leather piped facing is available is an option. If you like the Royal sofa design but would rather have it as a fabric sofa click here. These chairs are excellent companions to the Forest Sofa Vintage Leather sofas. Often used as an elegant library chair or as an extra piece for the home, relax in style and complement your furniture with your choice of wood colour and optional brass castors or solid hardwood feet. 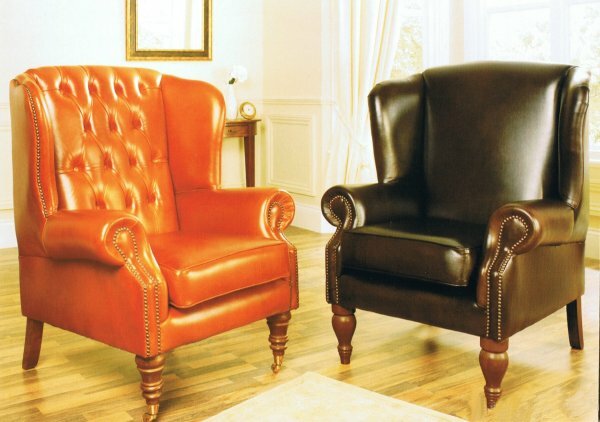 The image below shows the Regency wing chair in Pure Aniline Spice on the left and the Douglas Chair in Pure Aniline Dark Brown on the right. The Vintage Scroll Wing chair in Oxblood Red can be seen in the image to the left below and the Viscount Wing chair to the right. 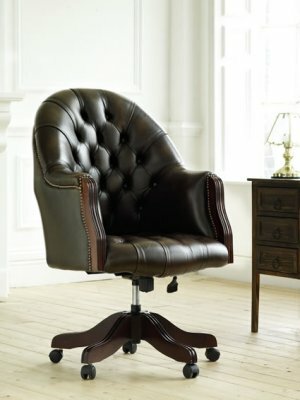 Choose between a Vintage leather Directors Swivel chair or Executive Swivel chair for your office both of which are supplied with a gas and tilt mechanism as standard and are available with or without buttoned seats. 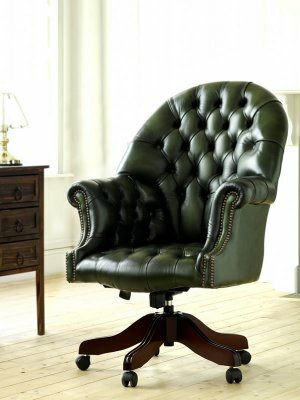 The image below shows the Directors Swivel chair in Antique Green leather on the left and the Executive Swivel chair in Antique Brown on the right. Click here to go direct to the Forest Sofa website for the full selection of furniture available. Simply choose what you want from the Forest Sofa website and ask us for a price. We offer FREE delivery to UK mainland addresses on all Forest Sofa furniture orders!